After helping the police catch a serial killer in On a LARP, Sidonie “Sid” Rubin and her best friends are on lockdown. Despite how impressive the group’s actions were, their parents were not pleased, and all but one of the five teens have been grounded for their senior year of high school. Yes, the whole year, and yes, that even includes stepping off school property to pick up lunch. That means the fearless friends have to suffer the ignominy of cafeteria lunches with the rest of the student body. Sid’s friend Vikram finds a loophole for our loveable “geek lesbionic brainiac” and the rest of their crew when he suggests they sign up for a robotics tournament. Not only will they get to work on something cool together, but their parents won’t have any choice but to let them get together outside of school hours to work on the project. It’s all going great until Vikram’s girlfriend, Ari, texts the rest of the group: “Vik. Melting down. Something about his stuff being gone. He’s pissed. Presentation in two hours, needs to get ready, not listening. Need help.” When they meet up with Ari, she explains that Vik’s Contagion account was hacked and all of his stuff is gone. As one of the MMORPG’s (massively multiplayer online roleplaying game) top players in the world, he had a wealth of weapons, potions, and antidotes, some of which were incredibly rare. The blow is so crushing that he can’t actually play that character anymore. Sid knows what she needs to do to help Vik be himself again—find the hacker and get his stuff back. And if she has to sign up for a Contagion account and sleuth her way through it night after night? Well, that’s what she’s going to do, and she’s going to get their friends to help as much as they can. 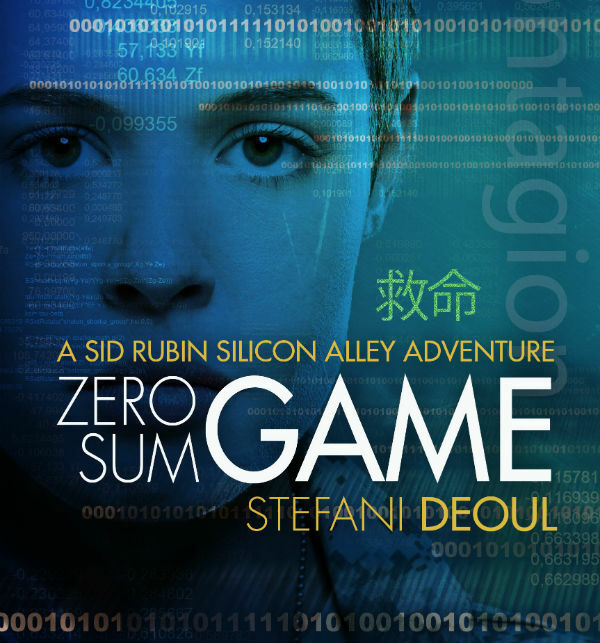 Just like On a LARP, Zero Sum Game is told in the first person from Sid’s perspective, so we’re right there with her as she hurtles through the events of the story. Sid is way too smart and she definitely knows it; her arrogance sometimes taking precedence over her friends’ feelings. Lucky for Sid, they love her anyway and embrace her, because she has a sweet side too. She also has a singular voice and it’s impossible to read this book or its predecessor without knowing intimately who Sid is in all of her smart-assed, loquacious, well-read glory. We didn’t find our thief that day, or for the next entire week. Which wasn’t for lack of trying, just for lack of time. Between classes, after school, and even before school can be summed up in one word: robotics. Since the night the challenge dropped, things have been moving at lightning speed. We do not have a lot of time and there is a ton of stuff to be done. I am rather chuffed (so love that word; it’s somehow “puffier” than just the old “I’m rather pleased,” and yet still falls, just barely, but nonetheless under the level of overly obnoxious braggadociousness) that our table’s design was deemed the better choice, and the assembling of the robot actually came together pretty seamlessly. Deoul does a fabulous job of bringing a lot of elements together—robotics, online gaming, working as a team to find the thief, and even what it feels like to be a teenager (remember those fits of laughter that went on and on until you were lightheaded because you and your friend kept bringing each other back into the laughter loop? There’s some of that as well.). Even better, she’s made Sid a thoughtful storyteller, because we’re never left out of the loop. Sid always explains things we may not understand otherwise, like MMORPGs. This also happens in a somewhat different way when Sid meets Ze, a nonbinary friend of a friend whose name is the same as one of their pronouns (they/ze), as Sid works through what that means. People who enjoyed On a LARP are also sure to like Zero Sum Game. And while it’s possible to read Zero Sum Game without having read the first book, you’d be missing out if you did because that one’s just as spectacular. Even if young adult fiction isn’t usually your thing, you may still find a soft spot in your heart for Sid and her pals. Stefani Deoul is writing some seriously fun books with this series and it will be fun to see what’s in store for our brainiac next.